Call us today for all your sign needs! Not in Baton Rouge? We can still help. We have relationships nationwide and can help wherever you are. 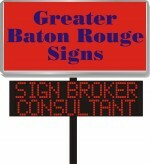 We are a regional sign broker and sign consultant. Don’t pay inflated New Orleans area prices. We’re just down the road and we can help. Whether you’re in Baton Rouge, New Orleans, Mandeville, Covington, La Place or anywhere in the area we have quick access to the signs you need and capable installers to get your sign up quickly. As a Baton Rouge sign broker we have access to both national factories and local firms for any type of indoor or outdoor sign you need.